Dating back to the 50’s, there has been a fascination with and a high demand for, the highly prized lobster. In chic white table clothed eateries in NYC or Chicago a 1 1/2 pound Maine lobster may cost $60 – at Red’s Lobster Shack in Wiscasset, Maine $19. From a lobsterman stopping by our boat $5 – but we do the steaming! Long considered a delicacy in and outside of New England and now spreading global, lobster is a routine way of culinary life here in Maine; however, you may not see it on the menu at highly acclaimed Primo in Rockland because James Beard award winning chef/owner Mellisa Kelly might say it is available in most other restaurants in the area. 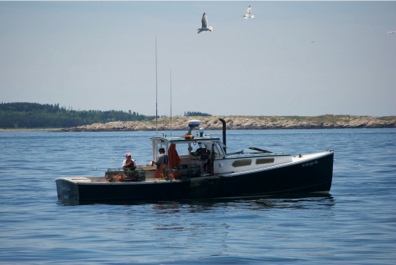 What we and others fortunate to spend time on Maine’s pristine coastal waters see is the other side of chic – the efforts expended by Maine’s lobstermen & women to bring this delicacy to our tables. Apart from the popularity of lobster, the economy of many rural coastal Maine towns and hamlets like Carver’s Harbor, completely depend on the lobster industry. The lifestyle can be brutal. Harvesting from May to December, the weather either side of July-September is problematic. Rain, fog, fierce winds accompanied by angry seas are routine challenges to this first leg of the lobstering industry. It’s a “rain or shine” business often handled by husband and wife teams. It is physically demanding, often disappointing as to the catch and worthy of respect from everyone with an understanding of what is required to bring lobster to the table. For us it is pure pleasure in pulling close, but not too close to interfere with their work, then coming to a stop, to wave or say hello and interact – they always wave back or will tell us how their “haul” for the day is going. Right now, not too well. 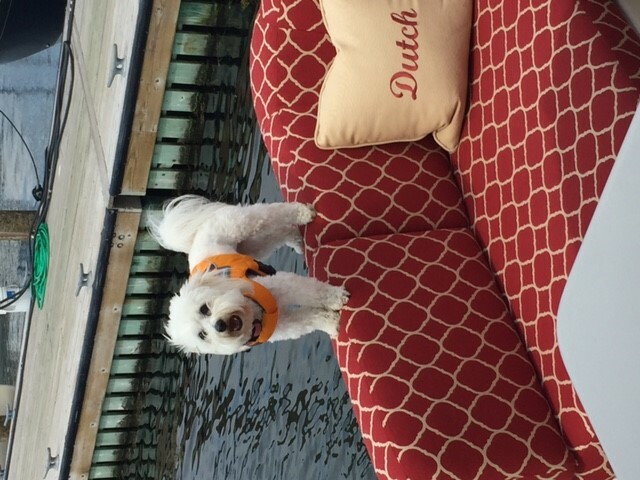 “The ‘lobstah’s’ are late this summah”. As a group, they know the seas and are the penultimate boat handlers, can feel the weather forecast in their bones, are territorial as to their fishing grounds and fiercely protective of their industry. We hope they understand our appreciation for their dedication, work ethic and for the delicious product they harvest. 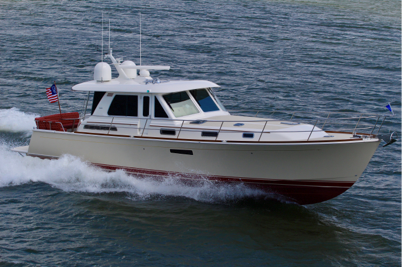 One of them mentioned that we have a remote connection with the lobsterman in that, from the deck up, their “Down East” styled boats were the design template for Sabre, our boat’s manufacturer, when they went into production in 1989. 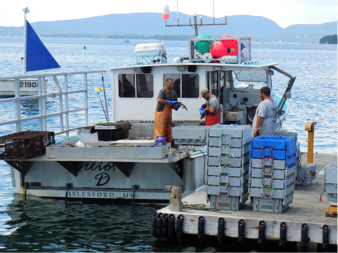 One lobster man said to us, “You are a lobster boat – on steroids”. We took it as a compliment, and Sabre would too. A Raymond Maine-built boat, partially fashioned after those lobstering in the lower, mid and down east coastal regions of Maine. Regardless of your opinion on global warming, the locals are telling us Maine waters have not been this warm in 50 years – off-shore right now, 59 degrees. Lobsters prefer cold water and the warming trend is sending them farther east, towards Stonington, here to the islands of Vinalhaven and further east to Nova Scotia where the industry is in a hyper-bull cycle. This is due in part to the general abundance of the crustaceans and a newly cultivated market exporting to Asia. What the warming means for the lower and mid-coast Maine lobster industry is up for discussion. There are multiple levels in the sale of a single lobster. From the lobster boat to the co-op, to the distributor to the food purveyor and finally to the food store or restaurant. Next time you buy a lobster you might think of the husband and wife team that it first came into contact with, quite possibly in foul weather. They were paid between $3.30 and $4.00 a pound. All the best from the three of us. 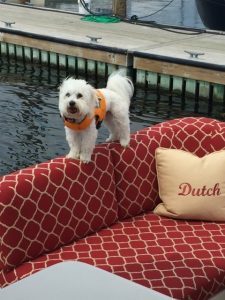 This entry was posted in Sabre Yachts Blog and tagged boating, boats, downeast, lobstering, maine boat builder, maine boat industry, Maine Boats, maine heritage, new england, sabre yachts, yachting, yachts. Bookmark the permalink.